An oil rich nation of Vikings and trolls, glaciers and fjords, whale hunters and polar explorers, Norway is a country that has long held my imagination as a beautiful, snowy land, where skiing was born and snowboarding is big. After several years of day dreaming, I decided that the time had finally come for me to snowboard the mountains of Norway and see Western Scandinavia through my own ski goggles. My preconceived ideas of Scandinavian efficiency are temporarily shattered when we board the old school twin prop Norwegian Wideroe plane, only to be told that the toilet would be out of order for the entire duration of flight. Luckily for me, my constitution was healthy and I was able to withhold my bodily fluids for the 2 hour journey in the tin can of a plane. 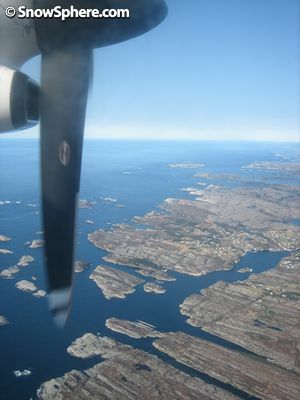 My first glimpse of Norwegian soil came as we flew over the labyrinth of fjords on the western seaboard. The clear sunny weather allowed perfect visibility of the hundreds of islands and inlets and an aqua blue sea which was amazingly clear, making it possible to see deep into the water even from the height of the plane. Upon disembarking from our small plane and entering Bergen airport, an amazing calm seemed to be descend upon us. Rather than the normal frantic behaviour and noisy announcements associated with most airports, Bergen was quiet, orderly and peaceful. We headed into Bergen central to catch a train to our final destination - the ski resort of Voss in western Norway. As we step into the carriage, it's as though we've boarded the sports and activities train; the racks are bursting with camping and skiing gear, and everyone is dressed in hiking boots and waterproof jackets. All aboard the ski train? Next stop: the great outdoors. After a Norwegian plane with a broken toilet, the Norwegian train goes a long way to redeeming the efficient stereotype; as to be expected, it's clean, quiet , smooth and bang on time. The young Norwegian naval cadet who sits opposite is engrossed in a copy of FHM, and pays little attention to the views - I suppose he's seen it all before - but as we chug deeper into fjord land, my eyes are glued to the window, as I try to saturate myself in the picture book scenery. We skirt round the edge of countless inlets, lakes and rivers, in a land dominated by rounded mountains and dotted with brightly coloured wooden houses of red, green and yellow. Norway is the western-most country of the Scandinavia peninsular, a long but narrow land, reaching far above the arctic circle, and unbeknown to most, as far east as Turkey and Egypt. Though now a peaceful and prosperous nation, at one time, the Norwegians were great warriors, explorers, traders and raiders (not to mention rapists and pillagers). During the age of the Vikings, in the 8th to 11th centuries, these Norwegian and other Scandinavian pirates set sail in their open topped vessels, to explore the seas and establish settlements all over Europe, as far a field as Iceland and Greenland and there is even some evidence written within the great Viking Sagas to say that they made it to North America. Nowadays, the Viking legacy is played out in museums and souvenir shops, the plastic horned helmet - which historians say were never in fact worn by the Vikings - is a tourist favourite. The country is extremely wealthy, due to its rich oil supplies and is the 3rd largest exporter of the black gold. Norway is also famed for its environmental awareness and forward thinking, which is reflected by its oil fund - whereby large amounts of profits from oil are saved and invested into new industries to support the economy when the oil wells run dry, a model that other oil rich nations in the Middle East are now following. 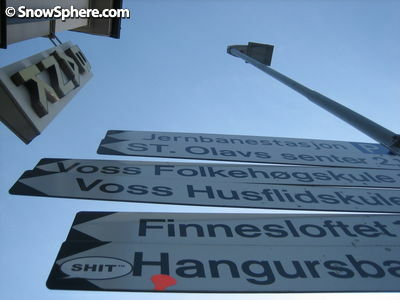 One area where the Norwegians lived up to their stereotype was their amazing ability to speak and understand English. Everybody we came into contact with on our trip, from bus drivers to bar maids, seemed to have no problems conversing in English, and do so with one added bonus; that seductive Scandinavian lilt. 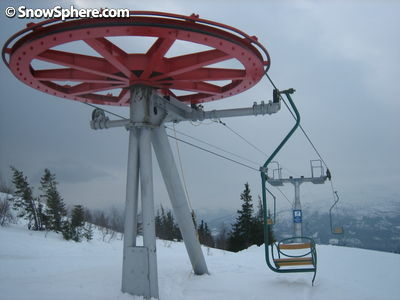 Norway's cold snowy latitude and mountainous terrain means the country has many ski resorts; some of the most well know are Norefjell, Hemsedal, Geilo, and Trysil. But our destination was to be Voss. 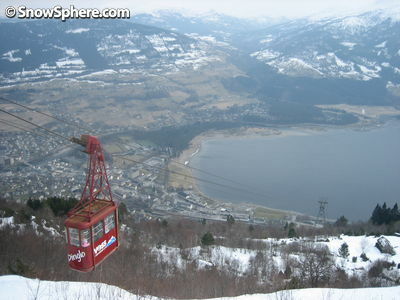 A long established ski resort (though not widely known outside of Norway), Voss is popular with local skiing and snowboarding Norwegians. 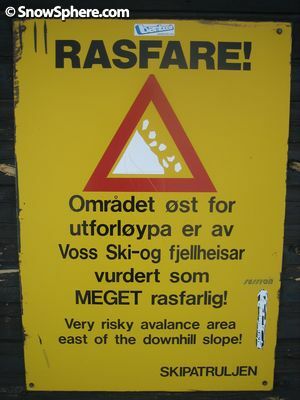 Unlike much of Southern Europe, Scandinavia and Norway in particular had enjoyed an excellent ski season, with heavy snows throughout the winter. We arrive at our destination and head to the hostel - the cheapest (though still quite expensive) place to stay in town. Unfortunately it's too late in the day to get any snowboarding or skiing done, so we head into the town of Voss for a bite to eat. Despite it being a Friday night Voss central is dead. In the empty streets I spot a wisp of graffiti which brings a smile; it reads "Thug Life". Voss' clean, orderly and immaculate appearance is pretty much the anti-ghetto. After wandering the streets and finding little open, we decide upon a bar recommended to us by the owner of a coffee shop. Now, you've probably heard the Norway is a little pricey, a touch expensive, somewhat dear…well - here's how expensive it is. An average burger and what looks like a microwaved pub grub style lasagne, 2/3 pint of the local brew, and a small glass of wine comes to approximately £40! We are far from impressed with the fodder, and don't stick around for too long. The Norwegian government positively discourages drinking with its high tax on alcohol that are double those in Sweden, five times that of Denmark, and the highest in Europe. Luckily, following the advice of the World Snowboard Guide, we bought a bottle of vodka at duty free which sees us through the weekend. With excited anticipation of what tomorrow's snowboarding will bring, we hit the sack after a stroll by the lake, and a few night caps of Absolute, and go to sleep dreaming of Norwegian powder. The new morning, we make the most of the breakfast which is included in the price. 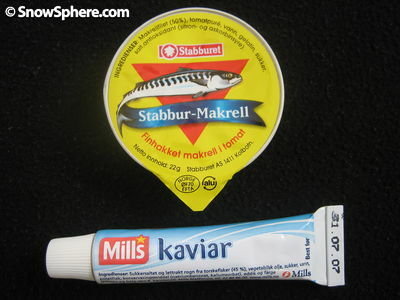 A typically Norwegian spread is on offer, consisting of sliced ham, cheese, various local breads, and slightly more interesting titbits of tinned mackerel and fish eggs. We catch the old school cable car up from the town to the mountain. Perhaps expecting it to be smaller, and flatter, I found it was actually more like one massive fun park. 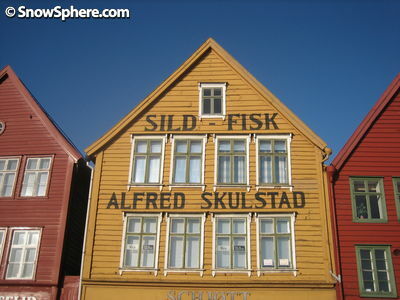 Set among the Hardanger and Sogne Fjords, the lakeside location adds plenty of eye candy to the area. Within the tree line, the pistes offer narrow roller coaster runs passing silver birch and pine, as well as natural bumps and jumps all over the place. Rising above the trees, the terrain opens out into a more barren landscape and although pistes are marked, the terrain is completely open, allowing you to ride anywhere - which I imagine make it perfect for a powder day. For us though - it's pure sunny spring snow - one of my favourite conditions, perfect for aggressively carving the slush up, with no fear of losing an edge. The sun us shining, the views of the lakes below are inspiring, and for some reason, there're almost nobody else on the slopes. Snow is to Norwegians what sand is to the Spanish. The white snow flats up on the mountain plateaus are akin to the golden sands of the Costa Del Sol. We count over 50 skiers who have ascended the mountain purely to lay out their roll mats and soak up the strong Norwegian sun. The terrain park has an array of rails, but is completely empty save for the crew of local rippers who sweep through the area, grinding, sliding and spinning off of every rail, lip, hump, bump and jump. Norway is famous for its ability to produce world class freestyle snowboarders; one of the most influential freestyle snowboarders of all time, Terje Haakanson, considered the best snowboarder in the world at his peak, is still going strong, winning competitions at the ripe old age of 32. "Did you wear lycra?" and "Are you gay?". 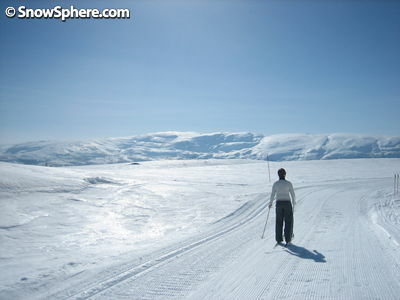 Now, while cross country skiing may not have the same young, vibrant image that follows snowboarding around like a bad smell, it does make a nice change to snowboarding, and is also a great workout. As Norway is the home of Nordic skiing, I was keen to give it a go in the country where it all started. My cross country skiing days began in Japan, where I used to ski over the snow covered rice paddies during the winter months. Those who are snowboarding purists may wince at the idea of cross country skiing (or skiing of any sort), but I am a lover of all things snow, and was keen to add another nozzle to my snow cannon, and thus joined the cross country skiing club at the Japanese school where I worked for two years. My ski skills came on slowly, much to the amusement of my students who continually outpaced me, but even though I was still getting lapped by 13 year old girls by the end of the winter, I took much pleasure in learning a new snow skill and even more so in being out in the white stuff enjoying the beautiful scenery that the snow always brings. So, it was great to be back on the narrow, tooth pick like skis and skiing in a somewhat wobbly fashion though the birch and pine lined trails. Compared to the completely flat rice paddy ski trails of Japan, the Nordic course was far more undulating which added an extra degree of excitement and difficulty to it all. Overall snowboarding in Voss was a superb trip; lovely friendly people, great snow and very picturesque scenery. However, this isn't the place to go if you're looking for a cheap trip. Be warned - skiing or snowboarding in Norway is a bank breaker - but this makes it an ideal destination for a short break, rather than a week long stay. If you're after a heavy night on the tiles - forget it. The fact that a pint of beer will cost around £5 and upwards discourages drinking, and tempers the night life. Norway is a prefect destination for a romantic ski break for two, or a (wealthy) family trip, but not an ideal ski destination for a week with the boys. Voss is an attractive ski resort with plenty for all levels of skier or snowboarder - but expensive compared to other countries in Western Europe.